With the Gaza Freedom Flotilla ship Al-Awda seized by Israel on Sunday, its 13,000 euros’ worth of medical supplies in the Israeli city of Ashdod and its 22 activists detained, the question of what happens next is on the minds of pro-Palestinian activists around the world. 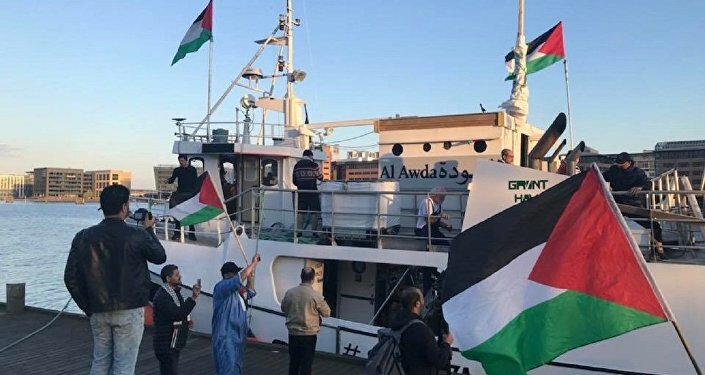 "The Freedom Flotilla Coalition calls on the Norwegian Government, the national governments of those aboard Al-Awda and the Freedom [Flotilla], other national governments and relevant international organizations to act immediately," Norwegian politician and activist Torstein Dahle said Sunday. The Al-Awda sails under the Norwegian flag. "The international community must assume its responsibilities and demand that Israeli authorities ensure the safety of those on board, the speedy delivery of our gifts to the Palestinian people in Gaza, an end to the illegal blockade of Gaza and to stop impeding our legal right of innocent passage to Gaza to deliver our gift of much-needed medical supplies," the activist continued. Radio Sputnik's Loud & Clear spoke with two American supporters of the initiative: Ann Wright, a retired United States Army colonel and former US State Department official in Afghanistan, who resigned in protest of the invasion of Iraq and became an anti-war activist; and Ariel Gold, a peace activist and the national co-director of Code Pink. ​Wright told hosts Brian Becker and John Kiriakou the Al-Awda had been hijacked — not merely intercepted — at about 1 p.m. Sunday, 49 nautical miles off the coast of Gaza — in international waters — and forced to go to the Israeli port of Ashdod with its load of medical supplies. The 22 activists on board had been tasered and detained and would probably be deported, she estimated for 10 years, based on her own deportation for having participated in past flotillas. "We are demanding that the Israeli government immediately send the medical supplies, which are, as you mentioned, 13,000 euros' worth of medical supplies, primarily sterile gauze and sutures, which were requested by the… Ministry of Health of Gaza," Wright said. "We demand that those be sent immediately, as is required under international law, for an occupying power to allow medical supplies to go into an occupied area." ​The activists then discussed the question of media coverage of the flotilla and the fate of the Al-Awda. "What I've seen in some of the coverage is that the Israeli military has said they will, in fact, themselves, deliver the aid. Ann this might be a question for you," Gold said to Wright, "whether you think that will actually come to be, or if they're just blowing hot air." Wright noted that Al Jazeera has been covering the flotilla news well and that the Israeli press is very interested in challenges by the international community to the Israeli policies on Palestinians, too, but that in Europe and the US it gets very little coverage. "One of the important things is that people in Gaza know that we're coming and that the media in Gaza is covering the progress of the flotilla." "And, in fact, there were press conferences the night before last, and there are people that have been out on the beaches and at the docks in Gaza City to hopefully welcome another attempt to break that illegal Israeli blockade of Gaza." So now that the Al-Awda is detained and the fate of its cargo in Israeli hands, what becomes of the expedition? The flotilla hasn't ended, Wright noted. "The Freedom ship is on the way; it should be arriving off the coast of Gaza in about 2 days," she said. "[W]e hope that it will be able to get into Gaza, because we are donating the ships of the flotilla; we are donating them to the fishers of Gaza. And we hope they can get through, not only with the medical supplies, directly into Gaza, but also we want to leave those boats for the fishers of Gaza." Gold, an American Jewish activist who was deported from Israel herself earlier this month for handing out pamphlets in the West Bank city of Hebron, noted that Israel is "cracking down more and more — and we're just watching it go into overdrive — on anybody who supports Palestinian rights and the ability of Palestinians to live at all." ​​"There is a growing global movement, and we're watching that time of change. And we're watching Israel become more and more terrified of it, and more and more repressive. Just yesterday, we saw an Italian painter that was doing a beautiful mural of Ahed Tamimi on the separation wall in Bethlehem, and the painters were arrested and are now being deported for creating artwork," the activist, whose group Code Pink was banned from Israel in January for supporting the Boycott, Divestment and Sanctions (BDS) movement against Israel, said. "Israel seems to think that by cracking down, by deporting artists, by blocking ships with humanitarian aid, by sending Palestinian children like Ahed Tamimi to prison, that they're somehow going to contain this growing movement for justice, but we're seeing quite the opposite, that their efforts are backfiring." Seventeen-year-old Tamimi was released from prison on Sunday, along with her mother, Sputnik reported. She was jailed for 8 months for striking an IDF soldier in her hometown of Nabi Saleh in the West Bank following her brother's severe injury by a rubber bullet fired by an Israeli soldier. Gold then explained the significance behind the hijacked ship's Arabic name. "Al-Awda means ‘the return,' and it's referring to the right of Palestinian refugees to return to the homes and lands that they've been expelled from. In 1948, when Israel established itself as a state, over 750,000 Palestinians were ethnically cleansed from their lands and their homes inside what is now Israel. And, in fact, around 70 percent of the population in Gaza are refugees from what is now Israel, and they're calling for their right, and this is UN Resolution 194, to return to their homes and lands," the activist noted. "Since March 30, Palestinians in Gaza have been engaging in weekly, and sometimes daily, nonviolent protests called the Great March of Return, at the border fence — that's really a prison fence — calling for the right to return as well as an end to the siege and [for] basic human dignity." "Israel has responded to this beautiful movement with deadly force," she noted. It's a war crime, she says. "Over 140 Palestinians in Gaza have been shot dead by snipers at these marches, among them have been many children, journalists who were clearly marked as press and medics." Despite all this, the Gazans continue to protest. Wright noted that the Palestinians have allies in Israel, too: Israeli citizens who are using their status to protest their government's treatment of Palestinians. "In Tel Aviv tonight, there was a gathering of peace people and those that are supporting of the Palestinian cause," Wright said. "One of our two Israelis that were on the ship, Zohar Chamberlain Regev, who was our boat leader, she attended that. 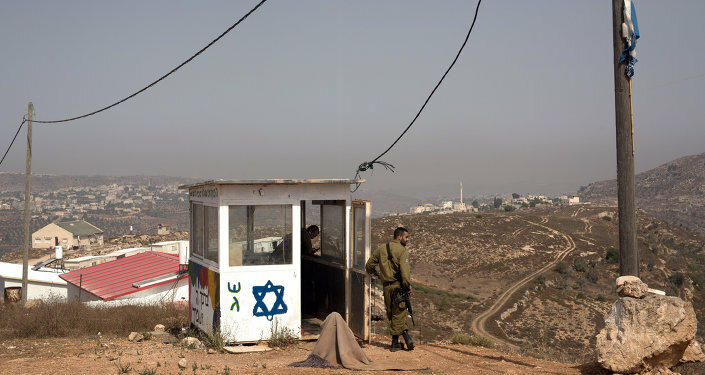 The other person, Yonatan Shapira, who was a former IDF soldier, and who is now part of a group called ‘Breaking the Silence,' of Israeli soldiers who will no longer do anything that the government says for them to do as far as oppression of the Palestinians." ​"They are both two brave people, because they know that the Israeli government will go after them big time when they go on these flotillas. But they are willing to stand up to the Israeli government… [by] saying, ‘You cannot continue to do to the Palestinians what you are doing, and we — as Israeli citizens, by our presence on these boats — we draw attention to your illegal criminal acts against the Palestinians.'" "Our goal is to lift the blockade over Gaza," Shapira said Saturday in an interview with Ynet News. "When a civilian group is fighting against a bigger body like a state, it has to develop creative ideas to succeed, and I'd be happy to hear such ideas from people." "I'm aware of the fact the mainstream media hasn't covered this flotilla, but we receive a lot of comments on social media, and it helps keep the issue of the siege over Gaza on the agenda," said Charlie Anderson, another activist aboard the Al-Awda who spoke with Ynet Saturday.